It used to be that cast iron for Dutch Ovens, skillets, pots and other pans was about the only material we had for cookware. But cast iron became less popular as new metals were developed for two reasons: weight and maintenance. Today, the maintenance issue has diminished because of improvements made by manufacturers of this cookware. 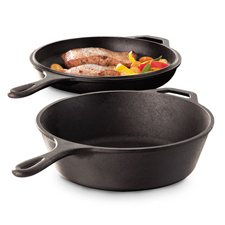 Much of the cast iron cookware today can be purchased pre-seasoned. And you can even buy cast iron cookware that has beautiful porcelain enamel exteriors. There are two basic types of Dutch Ovens and two very different places they are commonly used. For the purposes of this page, the focus is on using a cast iron oven (or a cast iron one with a porcelain enamel exterior) for your home kitchen as opposed to outdoors on camping trips. Anyway, about the only difference is that ovens made for outdoor cooking should have sturdy legs like the one pictured above. Ovens for home use do not have legs. What has always made cast iron a good material for cooking and baking is still true today. Cast iron provides even heating, heat retention, is not expensive and, if cared for, lasts a very long time. What about cast aluminum Dutch Ovens with porcelain enamel exteriors? Yes, they are lighter by far and they are more easily cleaned. But aluminum reacts quickly to temperature changes. Aluminum Dutch ovens will heat up much faster than cast iron ovens, but they also cool down much faster. The greatest drawback with aluminum cast ovens is they can melt if too much heat is applied to them! I personally would not purchase a cast aluminum oven. It really serves no purpose that can't be met by tri-ply stainless steel. There are many sizes and shapes of Dutch Ovens available today. Shorter ovens spread heat to the center faster than deeper ovens so they are good for cooking foods that need higher temperatures. Deep ovens on the other hand are ideal for cooking foods at lower temperatures or where you want to control the amount of heat on top for things such as rolls and bread. The oven size will naturally determine how much room you have for your food. An 8 inch, 2 quart Oven is about right for two or three people and is perfect for soups, stews, beans and family favorites. With a 12 inch, 6 quart oven you'll have room for a small roast, or chicken, potatoes, rolls and desserts but remember, you'll also have 20 pounds to lift. So a cast iron oven heats quickly and evenly, and retains heat exceptionally well for efficient cooking even over low heat. A heavy, tight-fitting lid seals in flavors by trapping steam and nutrients, so food self-bastes. Lodge Manufacturing has a line of enamel cast iron used mostly in the home kitchen (pictured to the right). The beauty of this cookware allows people the comfort of taking it from the oven or stove right to the table for serving. This is one of those "no need to season" cast iron cookware products I mentioned. You can use it for all types of cooking as well as marinating, refrigerating or freezing! 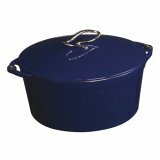 Because of its enamel finish it should not be subjected to temperatures higher than 450 degrees F.
Lodge also has a "combo" cast iron set you might be interested in. It is a versatile four-in-one design so it can be used as a deep skillet, fryer, or Dutch oven, and the dual-purpose lid inverts to become a shallow skillet or griddle. I love this! Here is another choice you have for a cast iron oven with the beauty of a glossy porcelain enamel. The manufacturer calls this round oven "the everyday pot" for its multifaceted uses: baking, broiling, braising, sautéing, or marinating. It goes from stove top or oven to table to refrigerator or freezer. Le Creuset is the company that makes this particular oven. I have not provided you with examples of cast aluminum ovens for a very good reason: don't buy one. If cast iron is too heavy for you, buy a covered roaster made of tri-ply stainless steel. It will serve the same purpose, do a better job than aluminum and last longer. Click here to read more. Have a good time pursuing your cookware interests.